Now you will not surprise anyone with a tattoo on your body: a tattoo is a popular and popular ornament. In large cities, people with tattoos can be easily met at almost every step. And it’s not just about youth related to informal subcultures: they also make tattoos for grown-ups, people, who hold managerial posts, including in public service. The most important thing, without which no tattoo artist can work, is the ability to draw. If you do not know how to do it – do not even take a tattoo-machine in your hands: just spoil someone’s skin. The better you can draw, the more you have experience, than the more techniques and styles you own – the more prospects you will have in this profession, and the more money you can earn. Therefore, first of all you should learn to draw. A lot of artists, even those, who are known outside of their country, have learned the art of tattooing on their own. Firstly, you should complete a full course of study in an art school. Secondly, you should get a medical education. Of course, this is not about studying for a dentist or a surgeon. But the courses of a nurse (nurse) will be very helpful: they are taught to properly disinfect the skin and the instrument and take care of wounds. In order not to waste time searching for useful information, you can also take courses from an experienced tattoo artist (working at home or in the studio). Now such trainings are offered by many masters. They can teach different things – from styles and directions in a tattoo and up to varieties and rules for choosing equipment. Subjects of training can be chosen independently – depending on what you already know and what – want to understand. Such courses are quite expensive: for 10-20 hours classes can ask for several hundred dollars. They can be held not only for beginners, but for those who want to learn some new style – because there are a lot of directions now, and everyone has their own nuances of work. Even if you are an artist from God, and draw pencil masterpieces – to work with a tattoo machine will have to get used to. Since the skin is not paper, and the paint from under it is difficult to remove, the first drawings are best done not on a person.For training you can use: artificial leather (sold in tattoo stores), pork skin. However, please note: the work with such material is not close to real work. The human skin is stretched, folded, wrinkled. Different ways of working and in different areas: for example, the easiest way (for the master and for the client) is to tattoo the shoulders, forearms, the back surface of the calf (calf), the upper and outer surface of the thigh. It is more difficult for the master (and more painful for the client) – to work on the ribs, abdomen, chest, inner thighs, elbows and knee folds, collarbones. Therefore on artificial materials it is recommended to train the most basic actions: maintain a straight line, creating contours (this is what you can and should train on artificial material most), painting, transitions of colors. After your hand has become accustomed to holding a typewriter and displaying lines – you can move on to practice. The easiest way is to use your own feet for the first “real” work. If you do not want to draw on your own – you can start looking for customers. 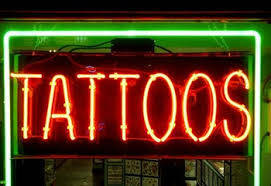 Among all types of employment, finding clients for a tattoo artist is the easiest and fastest. You just need to create a page in the social network, regularly upload pictures of your work there – and people will write to you. And you can and do not make a separate account, and specify information about their services directly on their personal page. However, this is not an initial stage. Offer a free tattoo to everyone you know. Have a picture on the body – now very fashionable, and those who want to save money (even a small tattoo is unlikely to be cheaper) will certainly be found. Get a job in a tattoo salons. Salons often take beginners on a free basis (or they can ask for more money).